Exclusive to the Load Rite Elite LR-AB, LR-AR, and LR-ASKI models. These steps are ribbed for added grip. Marine-grade carpeted wood bunks provide excellent support without marring the hull during loading and unloading. PVC side guides provide additional guidance when lining up to load on steep ramps. 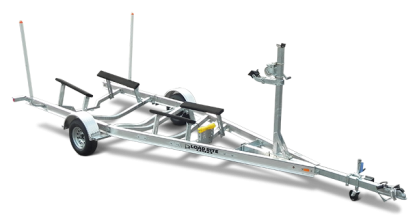 Standard equipment on many aluminum Load Rite Elite models including LR-AB, LR-ASKI, LR-AR, and LR-AS series. Optional on most other boat trailers including all 5 STARR models. Most tandem and triaxle models except pontoon.